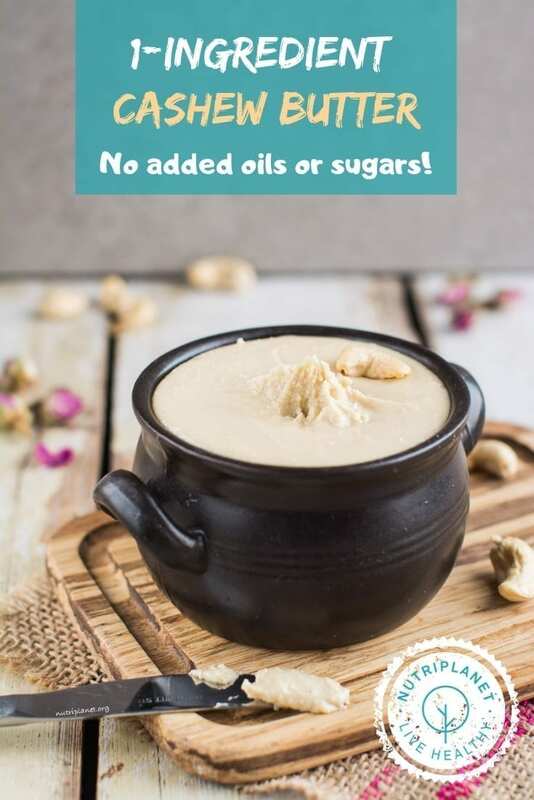 As you might have understood, the only ingredient in this cashew butter recipe is cashews 🙂 Now, this fact needs to be emphasized because I’ve seen many recipes and tutorial videos for nut butters where coconut oil is added to the nuts. In my opinion, adding oil to already fatty nuts is totally insane! I understand that this might be done to facilitate the process, but you only need some patience and the oils in the nuts will start to separate resulting in nicely smooth and creamy butter (without the added oils). Tips for buying and storing nuts and seeds. Why I prefer organic nuts and seeds. Benefits of soaking nuts and seeds. How to soak and dehydrate cashews. 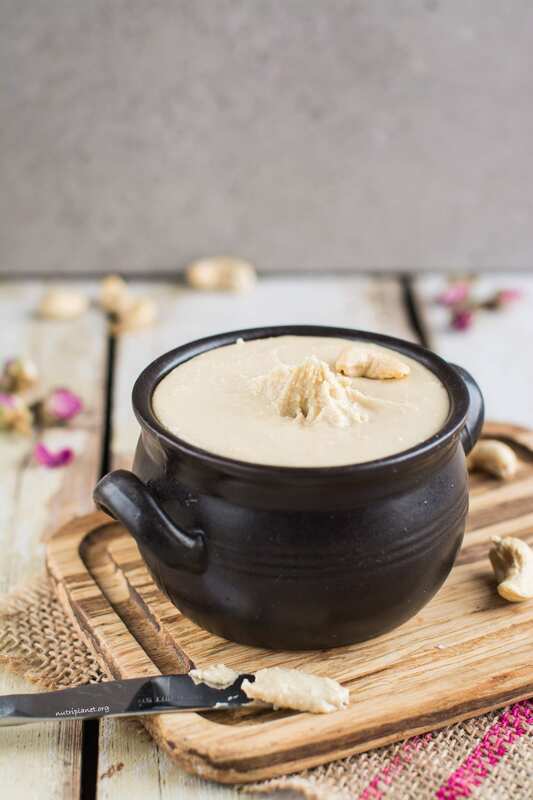 How to use homemade cashew butter. And finally, why I don’t recommend roasting cashews. How to roast cashews (should you still choose to do it). Secondly, if possible, buy in vacuum packaging. Thirdly, never buy loose nuts and seeds – air and light makes the oils in nuts and seeds go rancid. Once you open the package, store the nuts and seeds in airtight containers in refrigerator or freezer (longer storage). Chia seeds and flax seeds are the only exception, as they can stay at room temperature without spoiling. However, put them in fridge as soon as you grind them! Nuts and seeds are apt to absorb pesticides readily due to their high oil content. Moreover, the amount of pesticides used for growing nuts has been consistently rising in recent years. Soaking nuts, grains and legumes is especially important for those with sensitive digestive system. Un soaked nuts have phytic acid that inhibits mineral absorption and causes digestive ailments. However, you can easily neutralize the phytates and enzyme inhibitors by soaking the nuts in salt water (or salt and apple cider vinegar water) and dehydrating them at low temperatures. Remove or reduce phytic acid and tannins. Neutralize toxins in the colon as well as enzyme inhibitors and to encourage the production of beneficial enzymes. Make the proteins more readily available. Increase the amounts of vitamins, especially A, C and B vitamins. Prevent mineral deficiencies, bone loss and many other diseases and conditions. Soak cashews in glass or ceramic container in filtered water for 2-6 hours. Add ¼ tbsp of sea salt for each cup of nuts. Alternatively, use acidic medium such as lemon juice or apple cider vinegar – add a splash to soaking water. Rinse carefully to remove salt residue. Dehydrate cashews until they are crisp again at maximum 65°C (150°F) for 12-24 hours or until completely dry. Some sources also say that it’s OK to dehydrate cashews at maximum 100°C (225°F). Make sure they are fully dry or they could become mouldy. I have found many references to soaking nuts, grains, and seeds in water, salt water, or a warm water mixture with something acidic like yogurt, whey or lemon juice. It seems within 7 to 24 hours the enzyme inhibitors are neutralized and the anti-nutrients are broken down regardless of the method you choose. In addition, I found another interesting tip online: peanuts, cashews and walnuts should be soaked with food-grade hydrogen peroxide, which will help you avoid the potential minor health problems associated with ingesting them. It is advised to rinse them well before consuming or dehydrating. First, take your raw cashew nuts and soak them for 2-6 hours (see instructions above). Then, dehydrate until fully dry. You might skip the first 2 steps, if your digestion can handle the phytates and enzyme inhibitors in raw inactivated nuts. Next, pour the dehydrated nuts into high-speed or high-powered food processor. Then, start processing. 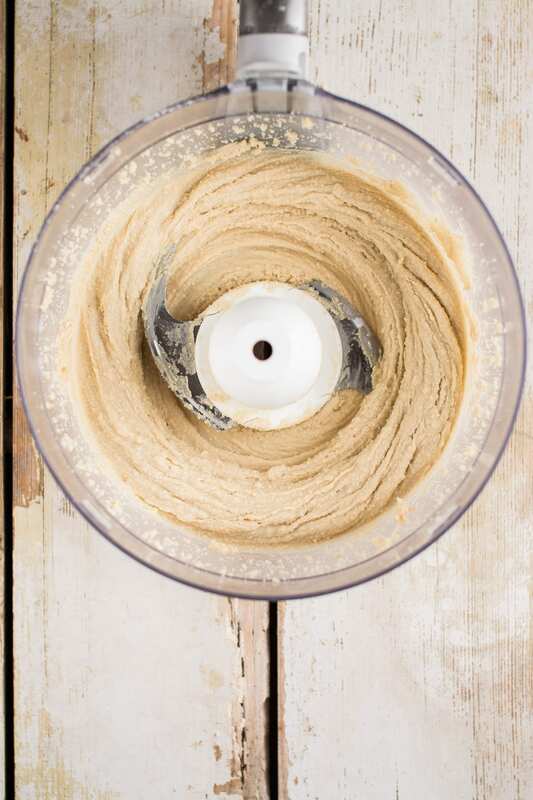 Scrape down the sides whenever the cashew paste starts to stick to the walls and bottom of your food processor. 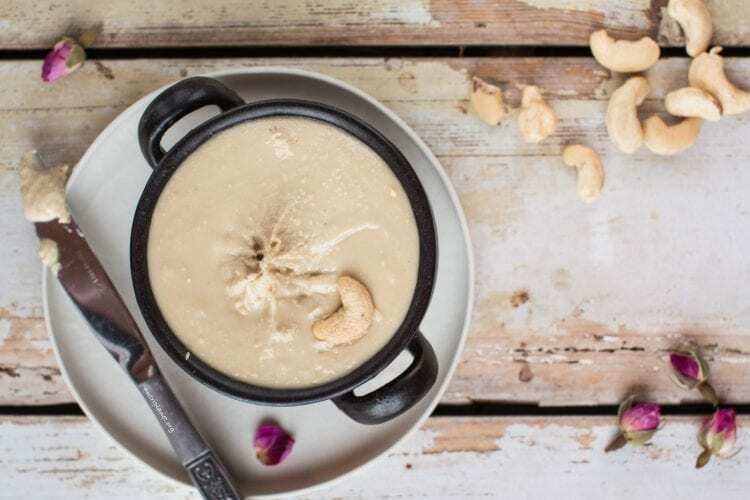 When the oils start to separate, the half-done cashew butter will form bigger clumps and finally you’ll see one big ball of cashew paste running around the processor. Don’t stop there! Separate the ball with a spoon or spatula and continue processing. Soon you’ll see that the ball starts to come apart and the paste will look more and more like real nut butter. Process a little bit longer and you’re done! It’ll all take about 15-20 minutes, so be patent! Nutritional info per one tablespoon (16g, 0.6oz): 94.7 kcal, 5.22g carbohydrates (20.9% of kcal), 7.02g fats (66.8% of kcal), 2.91g protein (12.3% of kcal), 0.53g fibre, 1.6mg sodium, and 1.8 GL points. You don’t need the latest and most powerful food processor to get the job done. Of course, it’d be much faster and easier with processors like Vitamix, but you definitely can do without. I prepare my homemade nut butters in 6-year-old 1000W powered Kenwood. I wouldn’t go lower than 1000W though – I still remember how we burnt down our first not-so-powerful blender trying to process nuts and dried fruits. Store your cashew butter in an airtight container in fridge. You can also make almond butter and peanut butter using the same recipe. However, soak almonds and peanuts for longer period of time – 8 hours. Make raw candies with cashew butter and one or few of the herbal powders – cocoa, carob, mesquite, reishi, spirulina, and/or cinnamon. Add a pinch of Himalayan salt to enhance the flavours and a preferred sweetener. You won’t need to add anything for sweetness, if you’re using carob and/or mesquite, as they are naturally quite sweet. I do not recommend roasting nuts. You should know that the soaking and dehydrating process is more careful when it comes to preserving the health benefits of nuts and seeds. You should be especially cautions about commercially roasted nuts as they’re often flash-fried in cheap, rancid oils. While dry roasted nuts are a better alternative, they’re still exposed to exceedingly high temperatures that denature the nutrients and cause the breakdown of fats, increasing free radical capacity. Do I buy nut butters? Yes, I sometimes do, because I’m not perfect. However, I always opt for organic raw butters, i.e. butters made from raw nuts and seeds. Spread your cashews evenly across the baking tray and roast for 5 minutes. Then stir them using a spoon or spatula. Return them to the oven and continue roasting in 3-5 minute intervals and stirring until they are done. Their colour should be a few shades darker and you’ll hear cracking and smell nutty flavour. It should take about 8-12 minutes (max 15 minutes). When they’re done, transfer them to another tray to avoid scorching. Use cake tin for smaller amounts – you can then easily shake them instead of stirring. Preheat a skillet on low to medium heat and toast a single layer of nuts at a time for 3 to 5 minutes. The nuts may begin toasting in less than a minute, so watch them closely and shake the pan frequently to avoid burning. If the cashews seem to be burning instead of toasting, turn the heat down a bit and lift the pan off the heat for a few moments. If you have a pile of cashews on the skillet, you’d need to toss them constantly to assure they’re toasting evenly.